The Deployment Manager is a process (in fact it is an special WebSphere instance) responsible for managing the installation and maintenance of Applications, Connection Pools and other resources related to a J2EE environment. It is also responsible for centralizing user repositories for application and also for WebSphere authentication and authorization. 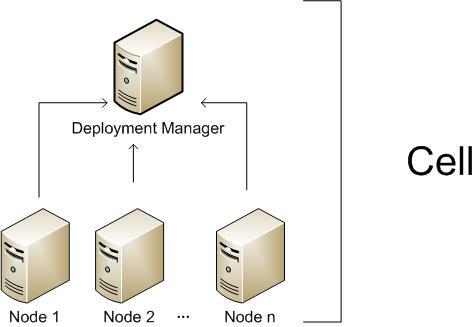 The Deployment Manager communicates with the Nodes through another special WebSphere process, the Node Agent. The Node is another virtual unit that is built of a Node Agent and one or more Server instances. The Node Agent it the process responsible for spawning and killing server processes and also responsible for configuration synchronization between the Deployment Manager and the Node. 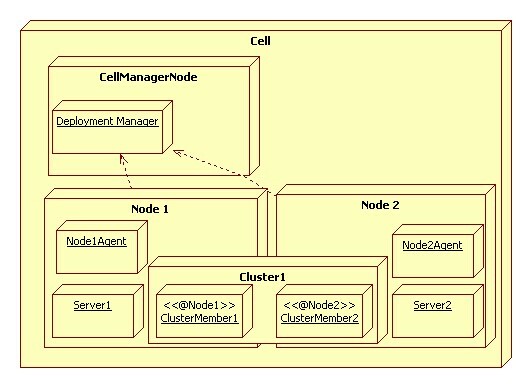 Extra care must be taken when changing security configurations for the cell, since communication between Deployment Manager and Node Agent is ciphered and secured when security is enabled, Node Agent needs to have configuration fully resynchronized when impacting changes are made to Cell security configuration. Servers are regular Java process responsible for serving J2EE requests (eg. : serving JSP/JSF pages, serving EJB calls, consuming JMS queues, etc). And to finish, Clusters are also virtual units that groups Servers so resources added to the Cluster are propagated to every Server that makes up the cluster, this will in fact affect usually more than a single Node instance. Lets finish this post with another diagram to illustrate all those concepts. If you already used JBoss you probably used (or at least knew there is) the DatabaseServerLoginModule. But, if you happen to be using WebSphere things are a little bit different. WebSphere (I guess version 6 onwards) comes with the powerful concept of the federated repository. This feature allows multiples sources for authentication and authorization. The final layout inside WebSphere ressembles an LDAP tree, every Repository is suffixed with an identifier. But, unfortunately, through the Web Administration interface you are limited to LDAP and the builtin FileBased WIM authentication. Another thing that makes it even harder is that there isn’t much documentation about these extended repositories. The information used for the registry lookup is customizable and can be made totally flexible if a custom registry is developed using the WebSphere Application Server custom registry interface. But still there isn’t a single link from this article that points out how to achieve this. If you get the key words in this phrase and risk a Google search you’d end up finding how to do this on WebSphere 4, that, by the way, was much limitted when compared to what is available on WebSphere 6. Refining this search a little bit you’ll find what you are looking for, how to do this on WebSphere 6. But you’ll only take this approach if you are willing to roll your own adapter, but be advised that this tutorial won’t cover every steps you need and this is the content of another post. There is a complex interface that needs to be implemented in order to fulfill the requirements of an WebSphere Repository. The complexity is derived from the fact that all method in this interface is based on commonj.sdo.DataObject class and this class maps an XML to a Java Object hierarchy making for now this implementation almost a guessing game since there isn't much public information regarding this interface contract. But, returning to the original objective of the post that was to guide on how to make WebSphere authenticate users against a database, setup the DBAdapter using the guide that is found on this page. If you want, check the list of WebSphere builtin adapters here. The last step is to create the tables for the database as described on step 3 of this post. This post in fact describes various possibilities for user repositories available in WebSphere. JBoss DatabaseServerLoginModule adantages over WebSphere approach are its simplicity and flexibility but on the other hand, WebSphere Federated Repositories present a much more robust approach for handling user databases. I’ll try to post some tips on how to roll your own Repository in the next few days.